Global and World Art in the Practice of the University Museum provides new thinking on exhibitions of global art and world art in relation to university museums. Taking The Fowler Museum at UCLA, USA, as its central subject, this edited collection traces how university museum practices have expanded the understanding of the ‘art object’ in recent years. It is argued that the meaning of cultural objects infused with the heritage and identity of ‘global culture’ has been developed substantially through the innovative approaches of university scholars, museum curators, and administrators since the latter part of the twentieth century. 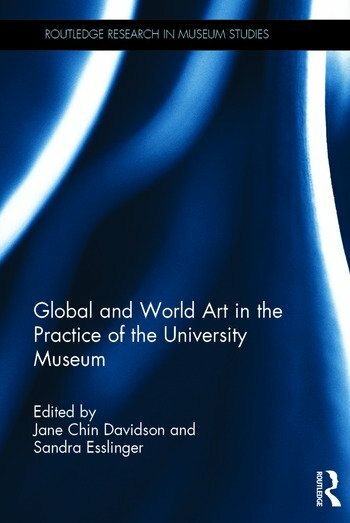 Through exploring the ways in which universities and their museums have overseen changes in the global context for art, this edited collection initiates a larger dialogue and inquiry into the value and contribution of the empirical model. The volume includes a full-colour photo essay by Marla C. Berns on the Fowler Museum’s ‘Fowler at Fifty’ project, as well as contributions from Donald Preziosi, Catherine M. Cole, Lothar von Falkenhausen, Claire Farago, Selma Holo, and Gemma Rodrigues. It is important reading for professionals, scholars and advanced students alike. Jane Chin Davidson is Associate Professor and Curator of Contemporary Art, Art History and Asian Art at California State University, San Bernardino, USA. Her research focuses on global exhibitions, transnational gender identity, and contemporary performance. Sandra Esslinger received her PhD in Critical Theory and Modern Art History from UCLA, USA. Her research focuses on the History and Art of Nazi Germany, emphasizing the construction of national and cultural identities.